This entry was posted on June 21, 2014 by admin. "I've never worn a corset before. 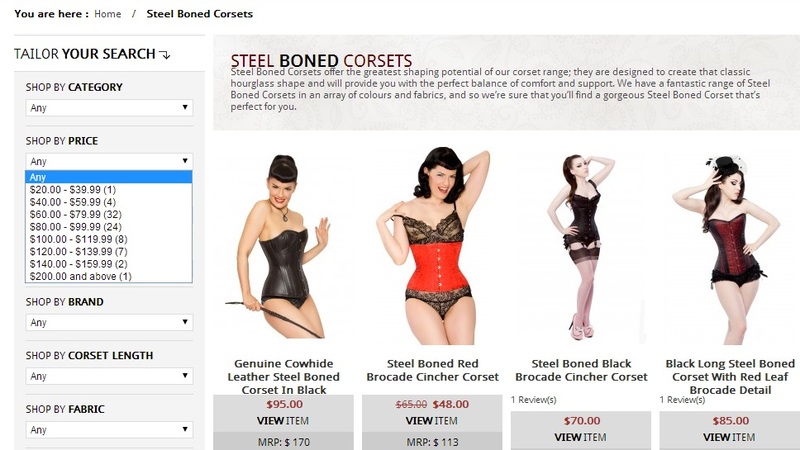 Which would be the best corset to start with?" Whereas this is an excellent question, I personally find the best way to answer it is to first have you answer a few questions. 1. What's your maximum budget? Personally, whenever I decide to treat myself to a little online shopping I find myself sifting through all the pretty things before me and then I land on something I love...and its out of my price range. Avoid any disappointment by narrowing your search with "shop by price"
2. What is the measure of you natural/relaxed waist in inches? This is probably the most important thing you will need to determine in order to select the best size for your needs. Once you have your measure, simply subtract 4" to 5" for a steel boned corset and 6" to 7" for a waist trainer. 3. Do you want to waist train? If you are looking to waist train, then I highly recommend going with a classic and simple style that will integrate well underneath your daily choice of clothes. Any sort of trim or even an overbust makes it far more difficult to keep your corset discreet. 4. Will you ever consider wearing this over your outfit, or do you want something that is easy to wear beneath your outfit? Much like question 3, you will want to determine if this is something strictly for wear beneath your clothes. If so, then simple and trim-free is the best way to go. Otherwise, if you think you will want to wear it over your clothing you can select virtually any textile with any trim, so long as it meets your aesthetic preferences. 5. If you are looking for a corset that you can wear as part of your day wear, then are you open to something that has a little bit of trim, or do you still want to keep it simple? Where will you be wearing your corset? What is the general feel of your wardrobe? Do you have many classic pieces or is there a lot of detail, ruffles, beading and trim? Some people still like to keep simple lines to their overall look, so this can still apply to a corset you wish to show off as part of your outfit. 6. What's the overall color scheme of your wardrobe? This applies to those of you interested in wearing the corset underneath your clothing or as part of your outfit. If you're a color lover, all about pastels or prefer mostly darks, then you should also consider getting a corset in a similar color scheme. 7. Do you have a preference between overbust or underbusts? Overbust corsets are absolutely gorgeous. Many people are drawn to them, and I completely understand. However, this is where I have to suggest that if you plan on primarily wearing your corset underneath your clothes, then an overbust may not deliver the silhouette you want. An overbust will pull your chest in and lift the bust up, which is stunning when worn alone or with a jacket or cardigan over. But when topped with a blouse, t-shirt or dress, you may find that the fabric doesn't drape over it in the most ideal fashion. 8. Do you have a longer than average torso or are you over 5'6" tall? Loads of people are looking for that perfect amount of tummy coverage. This is why frequently, customers will go with a 'long' style corset believing that because it is longer, it will cover more of their tummy. While this is not untrue, you do need to consider that it will also sit lower on your hip and higher under the bust or under your arms...not particularly comfortable. So unless you are over 5'6" or have a longer than average torso, steer clear of a long corset. 9. Are you open to considering a basic steel boned corset, or do you absolutely want a waist trainer? Many believe that in order to waist train, you must have a waist trainer. Not true! A steel boned corset will definitely do the trick. Whereas a waist trainer can cinch your waist by 6" to 7", a steel boned corset will cinch you in 4" to 5". The lesser waist reduction is frequently a great idea for those starting off. Anything more than that can be more difficult to get accustomed to if you've never worn a corset before. 10. Do you easily become or frequently feel overheated? If you do, you may want to consider going with either a cotton corset, or a mesh corset. If you are already sensitive to heat, then either of these options will help you remain cool vs. something like a velvet corset, which would only add to how hot you already feel, making things quite uncomfortable. So there you have it: 10 questions to think about before you select the perfect corset for your needs.